The communist regime is conducting a brutal purge and jailing human rights activists – including its most famous artist, Ai Weiwei, the creator of 'Sunflower Seeds’. The world should not stand idly by, says Salman Rushdie. 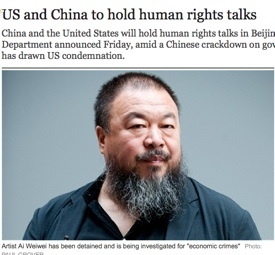 ....."Such figures as Ai Weiwei and his colleagues are often the only ones with the courage to speak the truth against the lies of tyrants," wrote Mr Rushdie, who spent many years in hiding following the publication of his novel, *The Satanic Verses. * "We needed the samizdat truth-tellers to reveal the ugliness of the USSR.